This week we are headed UP! We want you to find a flight of stairs with at least 10 steps & walk up once each hour (just walk up twice if your flight has less than 10 steps). It’s important to take breaks throughout the day to get the blood flowing. And walking stairs will work your quads and glutes, important leg muscles as we’ve learned. 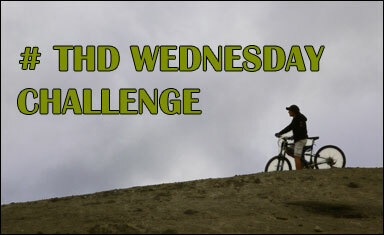 Keep in touch with us by using our Twitter hashtag #THDWednesdayChallenge or leaving a comment. Zee (@zeethd) and Suze (@suzethd) will be around and love to hear how you are doing! And you can join us on Facebook too! Another Wednesday, another challenge. This week we want you to do some lunges. 1 set of 5 reps each hour (10am-5pm) to be specific. But no cheating! We’re talking about 5 per leg each hour. Lunges are a fantastic lower body exercise. They work your glutes (What you need to work for that nice tush! ), quads, and hamstrings. If these muscles are strong, you will have less knee and ankle issues, as these muscles do a lot to stabilize your legs and hips. This is especially important for you walkers and runners out there! Don’t know how to do a lunge? Check out this demonstration from SparkPeople! Please check in with us through our Twitter hashtag #THDWednesdayChallenge. We love to hear how you are doing. Zee (@zeethd) and Suze (@suzethd) will be there! And you can join us on Facebook too!